Last month, and to my surprise, I was notified I had been nominated for the Top 100 Language Blogs competition run by Lexiophiles. The voting took place till July 28th and it is now over. The final results have been published on their site and I am very excited to have made it to the top 100! Congratulations to the many other blogs published by virtual and real friends I have made over the years which have also been shortlisted! You can explore the Top 100 Language Blogs list by clicking on the button below. Blogging is about communicating. And communicating has mainly been done through words, but also through images… because “an image is worth a thousand words”. Blogging is greatly enhanced by the use of images. And the use of images brings us to the concern about copyright. Although you cannot use any image you come across, there are sources of images which you can use, share and modify for different purposes. These enabling licenses are grouped under the term Creative Commons. Here’s a short video explaining the basics of how Creative Commons works. The second step is where to get these images from. You can use the Creative Commons Search engine to find them at http://search.creativecommons.org/ which performs a search in several image hosting sites and aggregators such as Flickr and Google Images. And you will probably find something interesting ready to be used. 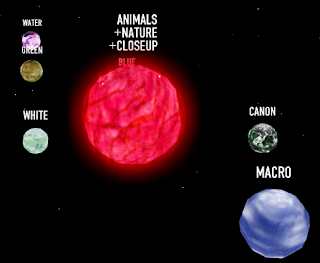 Another interesting image search tool that works with Flickr images is called Tag Galaxy. 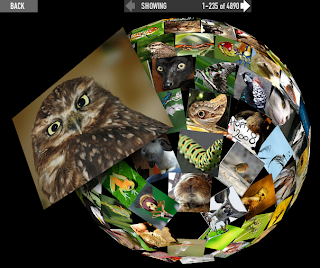 It allows you to refine your search until you are satisfied and it then shows the results as a dynamic 3D sphere of images which you can turn to see them all. In this case, you will need to check the copyright license of each of the images you are interested in. But finding the right image may not be enough. If the license allows it you can modify it. But how? 1- Modifying the image by using a photo editor to add certain effects to the image. 2- Selecting only a part of the image you have. An interesting tool to do screen captures of whole computer screens or parts of it is called Jing . This is only a very brief introduction to the topic of working with images and there are many tools available to work with them. Remember that images bring a text alive! Wordle is a wonderful tool to create word clouds and work with vocabulary. When I first came across it last year, lots of possible uses came to my mind!!! An important thing about how Wordle organises the display of words is that the size of each word in the display is related to that word's frequency in the text you enter. So that, if you want to enter a list of vocabulary items for a topic, you might want to enter the topic word a few times so that it appears bigger than the others. 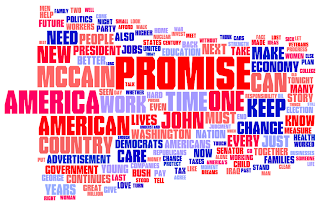 If, however, you are working with text from another source, the resulting Wordle will show that the bigger the words, the more frequent their appearance in the text you entered. 1- Entering a speech and analysing the ideas in it. 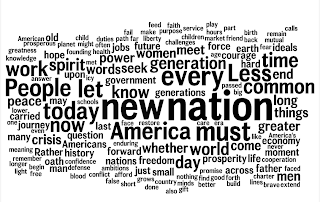 For example, if you entered Barack Obama's acceptance speech, you would see what ideas were more important in his speech by looking at the bigger words. You could also compare his acceptance speech and his inauguration speech to see if there were many differences (as shown in the pictures below). 2- Analysing a literary character either by entering his/her own words in the literary work or by asking students to create a list of describing words for this character. 3- Revising vocabulary by entering a list of words related to a topic. 4- Analysing language use in writing essays by entering a whole essay text and checking for repeated words and concepts. 5- Entering the whole text for a book you are reading in order to: a) make predictions about the book before reading, or b) analysing themes after reading the book. 6- Creating a personal profile to introduce themselves at the beginning of the school year. 7- Creating a visual display of your subject's content to show in the classroom. 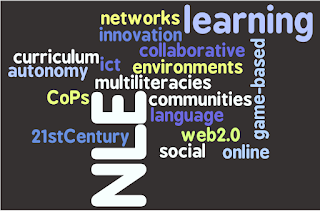 In this case NLE stands for New Learning Environments. Great ideas come with experimentation! Start Wordling!! !